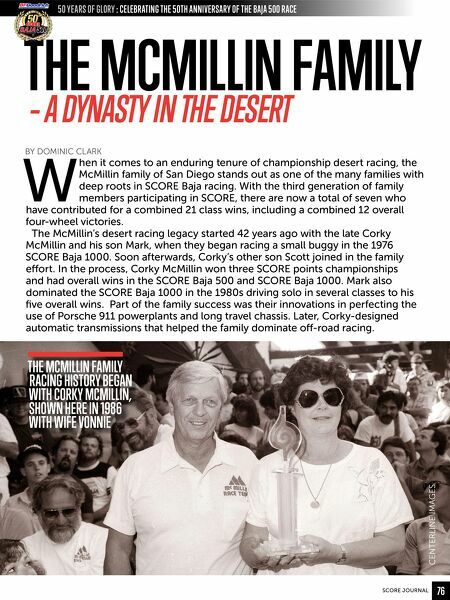 The McMillin Family – A Dynasty in the Desert By Dominic Clark When it comes to an enduring tenure of championship desert racing, the McMillin family of San Diego stands out as one of the many families with deep roots in SCORE Baja racing. With the third generation of family members participating in SCORE, there are now a total of seven who have contributed for a combined 21 class wins, including a combined 12 overall four-wheel victories. The McMillin’s desert racing legacy started 42 years ago with the late Corky McMillin and his son Mark, when they began racing a small buggy in the 1976 SCORE Baja 1000. Soon afterwards, Corky’s other son Scott joined in the family effort. In the process, Corky McMillin won three SCORE points championships and had overall wins in the SCORE Baja 500 and SCORE Baja 1000. Mark also dominated the SCORE Baja 1000 in the 1980s driving solo in several classes to his five overall wins. Part of the family success was their innovations in perfecting the use of Porsche 911 powerplants and long travel chassis. Later, Corky-designed automatic transmissions that helped the family dominate off-road racing. Within the SCORE Baja 1000 races alone, Corky McMillin won Class 2 with his son Scott in 1985. Scott won Class 10 in 1981, and again in 1985 with his dad. Scott also won the Overall SCORE Baja 1000 and the SCORE Trophy Truck class in both 2009 and 2011 with his son Andy. Mark also continued to win in Class 1 or Class 2 seven times in the 1980s including overall wins in 1981, 1983, 1984, 1986 and 1988. On September 22, 2005, at the age of 76, Corky McMillin passed away three weeks after suffering a heart attack while driving in a SCORE Las Vegas Primm 300 race in Primm, Nevada. “The racing, the desert, Baja California, it’s all part of being a McMillin,” said Scott McMillin after his father’s death. “I think when dad and Mark first drove in 1976, it was part of dad’s bucket list. He’d been going to Mexico and playing in the dunes and the desert for a long time. But as soon as he raced the SCORE Baja 1000, there was no turning back.” Although the patriarch of the family remains as a part of its rich history, the McMillin’s racing legacy continues with Mark’s sons Dan and Luke who have been prominent racers in SCORE. Scott’s daughter Jessica is also behind the wheel of her own vehicles. Luke won Class 1/2-1600 in 2011 and Class 1 in 2012 and Jessica won the Protruck class in 2011. Dan, who has won his in other SCORE races, is still looking for his first class win in the iconic SCORE Baja 1000. Andy McMillin has been very successful carving out his own SCORE racing legacy over the years, winning his first SCORE Baja 1000 in 2006 driving with Robby Gordon. This was on the eve of Jimmie Johnson winning his first NASCAR title at Miami-Homestead Speedway. When told of Andy’s victory during his pre-race press conference, Johnson said: “Congratulations to a great racing family ... the McMillins are the gold standard in the desert.” McMillin won again in 2009 and in 2011 with his father as co-driver. He also won back-to-back overalls in 2014 and 2015 while teaming with Rob MacCachren, to tie him with his uncle Mark’s five overall wins in the SCORE Baja 1000. Most recently, Andy McMillin won the SCORE Baja 500 in 2017 and is one of nine racers who have won the SCORE Baja Triple Crown award—winning the overall in the SCORE San Felipe 250, the SCORE Baja 500 and the SCORE Baja 1000. While the family continues to promote and be an integral part of off-road motorsports, it’s unlikely SCORE fans may never see an important race without the McMillins present. The philosophies of the family patriarch Corky McMillin, and his son Mark, has kept the family in its winning ways in the past and in the years to come.